I actually did this storytime the other day, but had so many other posts to catch up on, I didn't get to it until tonight. Unfortunately, once again my storytime fell on the day of a class party, so I tried to pull shorter books, and books that I thought would keep their attention with humor, and fit in with the holiday. 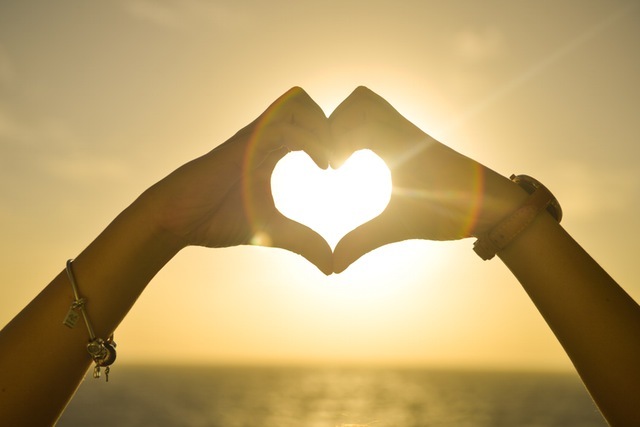 Though none were actually Valentine stories, they all had to do with love, hugs, and kisses. We started with our welcome song, then a brief introduction, followed by our story song. 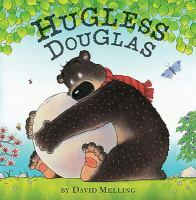 For the first story I chose Hugless Douglas by David Melling. This is the story of a young bear who awakens in the spring in need of a hug. He tries to hug different objects and animals, but none are quite right. Finally, the rabbit leads him to a cave where he finally finds the perfect someone to hug him, his mother. This story is a little longer, but it is cute and humorous, and this group did so well last time, I though they could handle it. After that, we sang a song about loving our parents, to the tune of "My Bonny Lies Over The Ocean". My mother says, "I love you." My father says, "I love you," too. Because I love them, too. 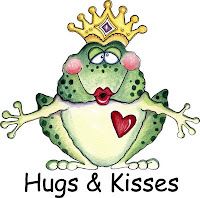 Hugs and kisses, I love you! For our second story I stuck with something very short and simple, with simple, bold illustrations. I used this on the Storytime Bus and found the kids really seemed to like it. The Cuddle Book by Guido Van Genechten shows different parent/child pairs cuddling with a simple phrase, like "Cats cuddle playfully." You can invite participation by asking the kids to name the animal, and asking questions, such as "would you want to cuddle a crab?" or "do you know what a baby kangaroo is called?". Next, we did a couple of rhymes with a little movement since the kids were pretty restless. 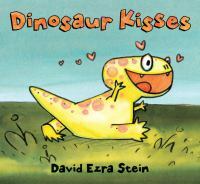 "I Have A Little Heart"
Then we were ready for our last book, which I chose because it was short, funny, and had been a big hit with every other group I had used it with, Dinosaur Kisses by David Ezra Stein. This is the story of Dinah, a newly hatched dinosaur who is exploring the world and trying new things. She sees two other animals kiss, and decides to try that next, but finds it is more difficult than she thought. This has some dark humor, with Dinah accidentally stomping on or eating the one she was trying to kiss, which some adults were a little shocked by, but all of the kids loved it. I had high hopes after this class was so good last time, but I knew with it being the day of their class Valentine's Day party they were likely to be wound up, and of course they were. They were all happy to see me, with lots of cries of "Miss Jennifer, Miss Jennifer" and hugs, but they really had a hard time settling down, especially one little group that kept bickering among themselves. I was a little disappointed they didn't have more interest in Hugless Douglas, as I think it's a very cute story and other groups have loved it, but I think it was just too long for them on this particular day. They didn't participate very well in the song, either, which surprised me since this group typically likes to sing. They did better with The Cuddle Book and they loved Dinosaur Kisses, and participated much better in the two rhymes. Overall, they did okay, and some of them listened very well, and if it had been a different day I'm sure they would've done even better.